Cardoon is a popular leaf-stalk vegetable of the Mediterranean origin. It is closely related to artichoke, the other edible thistle, native to the Southern European region. Many delicious recipes prepared using these stalks are part of the traditional Christmas Eve festivities in Italy, Spain, Sardinia, Sicily, and France. Botanically, it belongs to the composite Asteraceae or daisy family, in the genus, Cynara. Scientific name: Cynara cardunculus. Some of the common names include cardone, cardo, carduni, cardoni, cardi, etc. Cardoon is a hardy perennial plant that can grow vigorously in cultivated farms. It features robust growth characterized by a rosette of large, gray, spiny leaves and branched flowering stems. 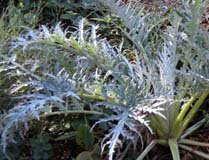 In general, plant cardoon is bigger than globe artichoke, reaching up to 3 to 5 feet in height and a spread of about two meters width. Bright purple flowers appear at the end of elongated, flower-bearing stems. The flowers, however, are smaller than that of in artichokes. A few weeks before harvest, its leaves bundled together and blanched by depriving exposure to sunlight as in escarole. Blanching removes bitterness and enhances their flavor. As in celery, cardoon too is one of very low-calorie leaf vegetable, carrying just 17 calories per 100 g. Nonetheless, it contains unique health benefiting plant nutrients such as antioxidants, fiber, vitamins, and minerals. Research studies suggest that certain bitter principles cynarine and sesquiterpene lactones in cardoon thistle extraction have overall cholesterol reduction effect in the blood through inhibition of its synthesis and increasing its excretion in the bile. Further, cardone petioles contain numerous phytonutrients such as luteolin, silymarin, caffeic acid and ferulic acid and di,caffeoyl-quinic acids, which protect cellular proteins, membrane lipids, and DNA from oxidative damage caused by free radicals. As in globe artichoke, cardoon too has excellent levels of vitamin folic acid, providing about 68 µg per 100 g (17% of recommended daily allowance). Folic acid acts as a co-factor for enzymes involving in the synthesis of DNA. Scientific studies have shown that adequate levels of folates in the diet during pre-conception period and early pregnancy can help prevent neural tube defects in the newborn baby. Additionally, its stems are also a rich source of minerals like copper, calcium, potassium, iron, manganese, and phosphorus. Potassium is an important component of cell and body fluids that helps controlling heart rate and blood pressure by countering pressing effects of sodium. The body uses manganese as a co-factor for the antioxidant enzyme, superoxide dismutase. Copper is essential in the production of red blood cells. Iron required for red blood cell formation. Cardoon stalks in a market. Fresh cardoon stalks (petioles) flood the markets during the fall and winter. You can find fresh greens as well as blanched, creamy white bent stalks (“gobbi” or hunchbacks) tied in bundles in these local vegetable markets. Choose firm, stout stalks with bright silver-grey leaves. Avoid wilted petioles. You may also find a dwarf, sturdy, and spineless varieties in the markets. Buy only a few bunches at a time. Once at home, store fresh cardoons in a paper towel and place in the refrigerator. They keep well for up to a week. You may also want to prepare, blanch, and store them in a plastic bag and place inside the refrigerators for any later use. Cardoons are one of the traditional winter season vegetables employed in cooking in most parts of Europe. In appearance, its stalks (petioles) resemble as that of celery stalks. Its stalks have a unique, sweet, nutty flavor grayish-white flesh. To prepare, trim off any leaves or thorns, and peel the stalks using a vegetable peeler to remove tough strings. Cut them into 1-inch length pieces. Cut sections tend to discolor; place in cold water with lemon juice (acidulated water) to keep them from turning brown. To blanch, put cut pieces in boiling water for about 20 minutes until they tenderize. Drain, immediately shift them into a bowl of cold water. Remove and spread them on a paper towel. Thus, blanched and readied pieces can be used in recipes or stored in the refrigerator for future use. Cardoon can be braised, sautéed, boiled in soups and stews. Prepare mouth-watering cardoon gratin dipped in batter and deep-fried or baked with butter and cream/cheese. The cardoon root, which is a thick, fleshy and tender underground root of this plant, is often boiled, and then served cold in salads. Boiled or roasted, it can be enjoyed with warm dip bagna cauda- native to Piedmont province in Northern Italy. <<-Back to Vegetables from Cardoon. Visit here for an impressive list of vegetables with complete illustrations of their nutrition facts and health benefits. <<-Read on Artichoke nutrition facts. 1. Inhibition of Cholesterol Biosynthesis in Primary Cultured Rat Hepatocytes by Artichoke: http://jpet.aspetjournals.org. 3. Virginia Cooperative Extension- PDF.